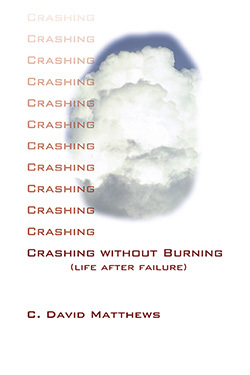 Crashing Without Burning offers perspectives on why we fail, how God is related to our failures, and the role of faith in finding new promised lands beyond our failures. Matthews writes from the background of an increasingly common scenario: the discovery of a prominent minister's moral indiscretion is made public; threatening to destroy a career, a family, and more than one life. Eleven years after such an experience, David Matthews writes of the possibilities of life after failure. Crashing Without Burning provides understanding, reorientation, and hope for all sorts of people who must cope with the consequences of their own failures. Matthews writes that, while some degree of failure may be a human inevitability, it does not have to be fatal. Resources of grace are present in even the most tragic situations, so that precisely out of our failures may emerge our most significant opportunities for growth and life. C. David Matthews is pastor of Good Samaritan Church, an interdenominational church in Orlando, Florida. He has served churches in Texas, Oklahoma, South Carolina, and Florida. He received degrees from Baylor University, Florida State University, and Southwestern Baptist Theological Seminary. He is an author and contributor of several articles and books, and also the composer of numerous hymns. Matthews is widely known for his gifted sermons, lectures, and speeches.